In 1987, Industrial Light and Magic partnered with Walt Disney Imagineering in the making of Star Tours, an animatronic and simulator film ride - rooted in the Star Wars saga - in which vacationing passengers board a StarSpeeder shuttle and are taken on a hair-raising test flight piloted by a rookie robot. Effects art director Dave Carson and effects supervisor Dennis Muren orchestrated four and a half minutes of continuous effects footage simulating an uninterrupted view from the StarSpeeder passenger bay. The film was first developed in a full-length videomatic that employed cardboard cutouts and simple, wire frame computer graphics. 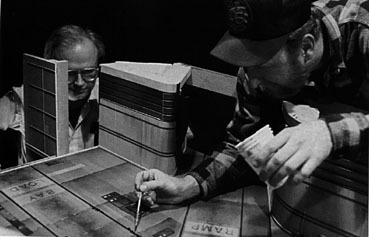 The videomatic served as both a reference in the model photography and a basis for early programming of the motion base. Motion control photography of miniature sets, such as the launch station, an ice tunnel, and the Death Star followed. Sudden banking turns helped to mask cuts and make the film appear seamless. In this scene, as we fly into the Death Star Trench, the film seamlessly cuts from a wide matte painting to a matching model. Ion blasts from the tower that is firing in the matte painting on the left hit the screen twice, filling the screen completely with white. On the second hit, the white is used to mask a cut to a model that closely matches the matte painting. After the cut, the camera changes its angle and dives down into the trench. 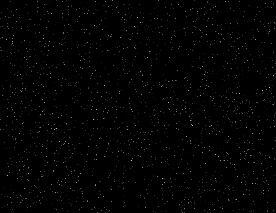 Once you know to watch for this, you can see the cut while watching the film at normal speed. The four Star Tours simulators are actually large military flight simulators that were purchased at a cost of half a million dollars each. Oddly enough, to map the movements of the simulator to those of the film, a programmer sat inside the ride and manually synchronized the movement of the StarSpeeder with that of the movie playing on screen. Final cost of the ride totaled that of thirty-two million dollars, almost twice the cost of building all of Disneyland in 1955. Amazing how things changed from 1955 to 1987.